Self care refers to any intentional actions you take to care for your physical, mental and emotional health. So basically anything that makes you a healthier person should be done on a regular basis. Like showering and brushing your teeth are both common self care routines. 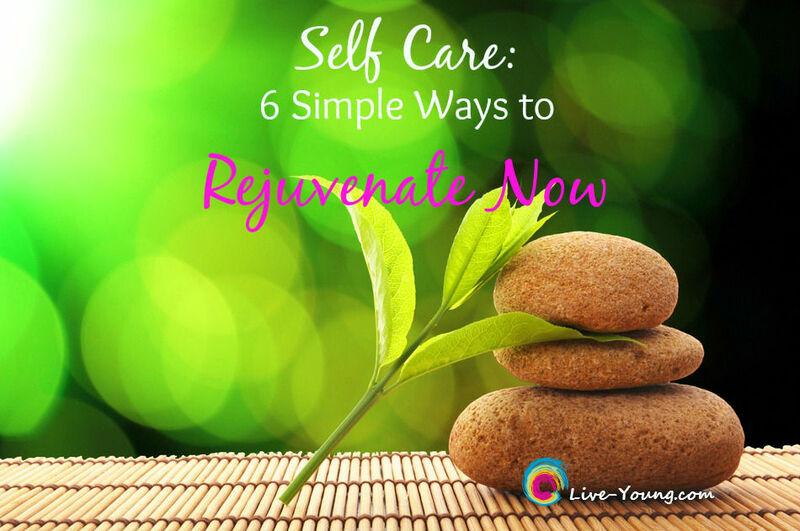 6 Simple Ways to Rejuvenate Now! Rejuvenation allows you to feel and look young, healthy and energetic in the present moment. Below are six simple ways to lead you in the direction of developing a daily self care routine for a more healthier you! Think of…calm, rest, soften, unwind, recline, breathe easy. Rest a minimum of seven hours for a good night’s sleep. Establish a nightly routine with a comfortable sleep environment. Benefits include improved productivity and emotional balance. Think of…recover, strengthen, rebuild, replace, improve, heal. Food is a type of self care that is often overlooked. Take time to sit down and eat without distraction of electronics. Allow your body to get adequate nutrition with healthy snacks and meals throughout the day. Think of…replenish, stimulate, exhilarate, cool, reinvigorate, cheer. Stimulate your body with an detox bath. First dry brush starting at your feet upward towards your heart. Next sprinkle and stir to dissolve in a hot bath; 1 cup Epsom salts, 1/2 cup baking soda and your favorite essential oil to remove toxins and increase magnesium and pH levels. Think of…energize, encourage, invigorate, overcome, rekindle, recover. Energize each day with joy and laughter! Find something or someone to make you laugh…funny video or good joke. Always have something joyous to look forward to. Think of…reaffirm, continue, reestablish, repeat, freshen, reawaken. Continue to move your body. Physical movement is important to incorporate into your daily life to reduce stress, maintain muscle balance and a healthy body. Pick a activity you enjoy and do it. Think of…relax, restore, refresh, revive and renew. Start now using these six “R” words and develop your own self care routines. Make yourself as important as everyone else in your life. Be sure to book “me time” appointments on your daily calendar. This will increase the success of accomplishing new routines. Rejuvenate now so you can feel and look young, healthy and energetic in the present moment.